Many years ago I was looking for a method which falls between the physical yoga and cognitive approach of psychology. 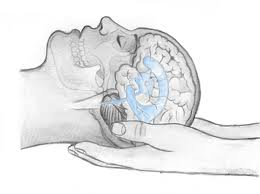 Although I attended several courses and read many books on the topic only years later I could meet Craniosacral Therapy ( CST). So far, I carried out two levels and I use them regularly – I can say without subjectivity that with excellent results. The method is developed by an American physician (Dr. Upledger ) and its essence is the rhythm of cerebrospinal fluid production used for fine manipulation of the body. The method is verified by many scientific publications, case studies and has a world-wide network. CST is a noninvasive technique so it does not use the muscle power of the hands. Behind the softness lies a mechanism that stimulates the body ‘s self healing process, making it almost impossible for any harmful side effects. CST improves quality of life – reducing stress , improving the immune system. The body also carries imprints caused by daily conflicts which cause “vitality leaks” and resolving them CST brings back the physical vitality. The therapy aims to relax the connective tissue boundaries and plates, fixing joint connections’ tensions and muscle relaxation. All this is normalized with the help of the cerebrospinal fluid production rate. The reach of deeper tissues it can harmonize the internal organs and glands as well.